The US publishers of a video game banned in the UK and Ireland have described it as a "fine piece of art". The sale of the game is unlikely to go ahead in the US and has not been granted certification in the UK. "It brings a unique, formerly unheard of cinematic quality to interactive entertainment, and is also a fine piece of art," Mr Zelnick said. The game has been designated Adult Only in the US but both Nintendo and Sony have confirmed that the title will not be able to be released on their platforms as originally intended. In a statement, developers Rockstar said they were disappointed by the British Board of Film Classification's (BBFC) decision to refuse classification of Manhunt 2. It said: "While we respect the authority of the classification board and will abide by the rules, we emphatically disagree with this particular decision. 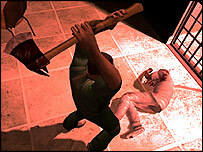 "Manhunt 2 is an entertainment experience for fans of psychological thrillers and horror. The subject matter of this game is in line with other mainstream entertainment choices for adult consumers." Rockstar are also the developers of other controversial titles including Grand Theft Auto and Canis Canem Edit. In rejecting the game, David Cooke, director of the BBFC, said: "Manhunt 2 is distinguishable from recent high-end video games by its unremitting bleakness and callousness of tone. Rockstar's statement continued: "We believe all products should be rated to allow the public to make informed choices about the media and art they wish to consume. "The stories in modern videogames are as diverse as the stories in books, film and television. The adult consumers who would play this game fully understand that it is fictional interactive entertainment and nothing more." 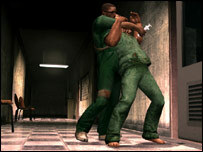 Manhunt 2 was developed for the Nintendo Wii and PlayStation 2 consoles.